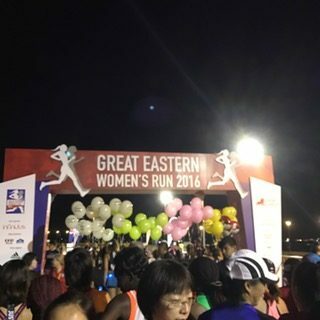 Race Review: Great Eastern Women's Run 2016 [21.1km] (by Sharon) | JustRunLah! Wow! What an amazing race! This year’s GEWR is definitely my most enjoyable run to date – in the 18 short months I’ve been running. This is the second year I’ve participated in GEWR. 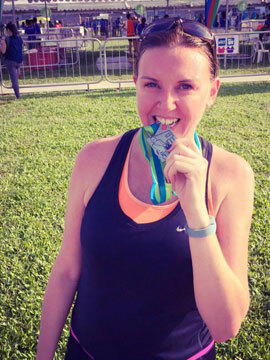 Last year was my first half-marathon (and my second ever race), which I completed with friends. 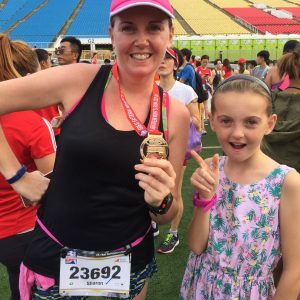 This year, I decided to have another bash at the 21.1km and see if I could improve on my time, which would mean a PB for me. 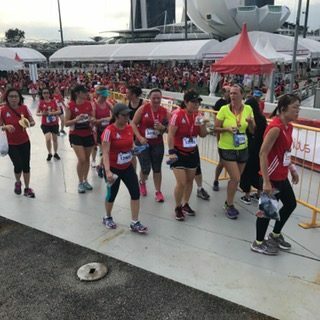 The Great Eastern Women’s Run is Asia’s biggest women-only running event, comprising of the half marathon and 10km competitive categories, as well as a 5km Fun Run and the popular Princess Dash. The $65,000 raised will go to The Breast Cancer Foundation and The Women’s Health Research & Education Fund, two very deserving causes. Although I had all my running gear laid out the night before, I still set my alarm for the unearthly hour of 3.00am. I barely slept a wink anyway, between the excitement and the nerves! I arrived at the Flyer super early and there were quite a few ladies there waiting for the race pen to open. To my absolute horror, the portaloos were locked! Only two of them were open and there was quite a long line for each one. Thankfully, after a few panic-stricken minutes, the toilets were opened and near crisis was averted. The race pen opened at 4.45am, so I made my way in and was lucky enough to get close enough to the start line, where we could see the Elite runners shoot off at 5.15am. Wave 1 of the open category flagged off a few minutes later. I was aiming for a 2:15 finish, hoping to shave 30 minutes off last year’s time. The weather was lovely and cool too. I often find it difficult to pace myself on race day. It’s easy to get caught up in the crowds and go ‘all out’ in the first couple of kilometers. Not this time. 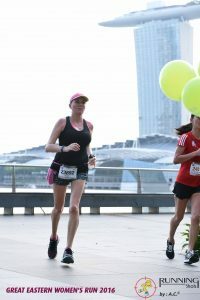 My plan of action was to try and keep up with the 2:15 Pacers. So with eyes on the prize; in my case the mint green balloons, we set off. The balloon-wielding lovelies that I had the pleasure of running with were Judy, Sally and Xue Yu. 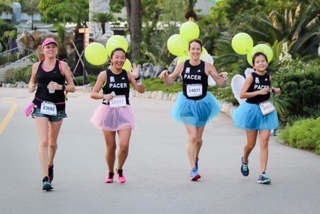 These gorgeous ladies supported and motivated us runners throughout the entire race. I am familiar with the route and so found the first half of the run fairly comfortable and even enjoyable. When we hit 12km, I started to struggle. I felt like I needed to slow down and walk for a while but I remembered a meme that a friend had sent me the day before which made me smile and keep going. “Run like there’s a hot guy in front of you and a creepy guy behind you!” At 16km, my playlist was starting to irritate me so I took out my earbuds and listened to my own laboured breathing instead. There were planty of hydration points along the route – I especially loved the ice cold 100 Plus. Divine! 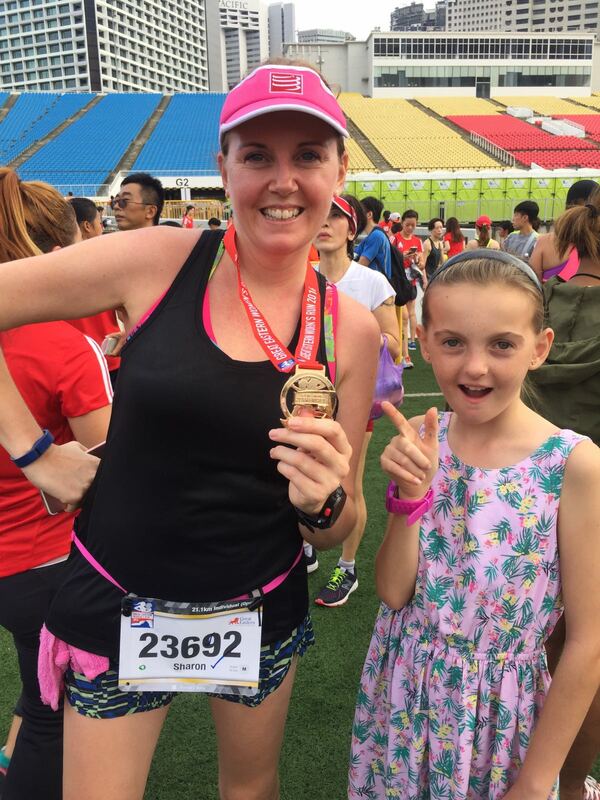 I couldn’t quite believe it when we reached the 19km marker. 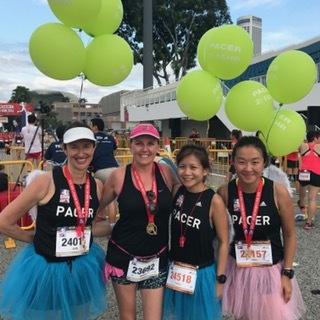 My calves were screaming and I really, really wanted to stop, but with only 2km to the finish line and my target time within touching distance, I clung on to the Pacers for dear life. 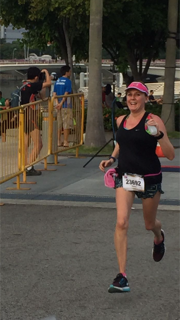 The last km is a bit of a blur but with about 500m to go, I pushed forward for an attempt at a sprint finish – delighted to see my husband and daughter cheering me on as I approached the finish line. I came in with the unofficial time of 2:11, which I am over the moon with! 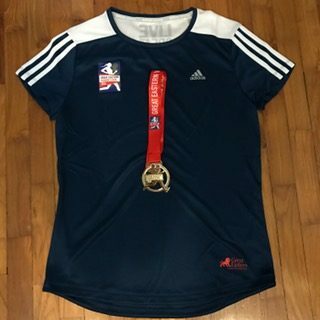 Collected my race medal and finisher’s tee – which I love – and met with my husband and daughter in the race village. 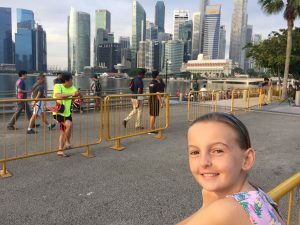 The place was buzzing and we had muffins and ice-cream and lots of photos.